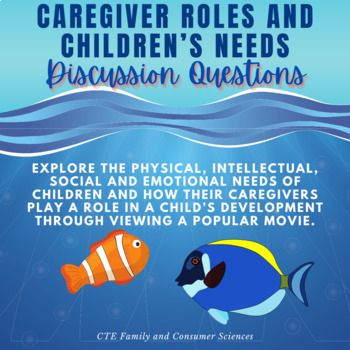 Explore the physical, intellectual, social and emotional needs of children and how their caregivers play a role in a child’s development through viewing Finding Nemo. 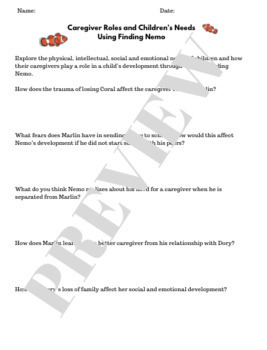 These discussion questions can be used for class discussions, essay prompts, test questions or students can answer them while viewing the movie. I used this for introductory lesson to the basic needs of children for Principles of Human Services, but could easily be used for Principles of Education & Training, Human Growth and Development, Child Development, Child Guidance, Psychology or related course. Check out my Children's Needs Graphic Organizer for free that pairs well with this! Principles of Human Services 4A: The student demonstrates the skills necessary to enhance personal and career effectiveness in early childhood development and services. The student is expected to identify the basic needs of children. 4.2.4 Analyze abilities and needs of children and their effects on children's growth and development. PDF and Word versions included. Fish clipart free from The Painted Crow on TPT.